Filed under lego on December 01, 2016. In the past year, No Starch Press sent both The LEGO Architect and Geeky LEGO Crafts: 21 Fun and Quirky Projects for a review. 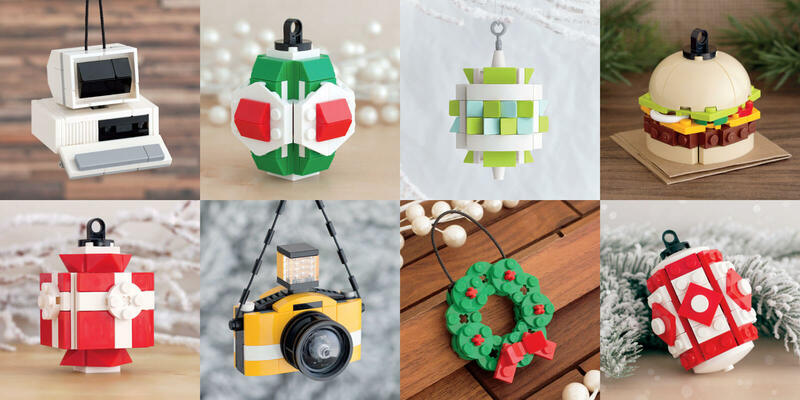 On October 6, 2016, I also found Chris McVeigh’s new book, The LEGO Christmas Ornament Book: 15 Designs to Spread Holiday Cheer in my mailbox. I mentioned in my Geeky LEGO Crafts: 21 Fun and Quirky Projects review that I was a huge fan of McVeigh’s style so I was thrilled to receive this new book. Chris is well known among the LEGO community. He has an active social media presence on multiple platforms and maintains his LEGO related site at chrismcveigh.com. 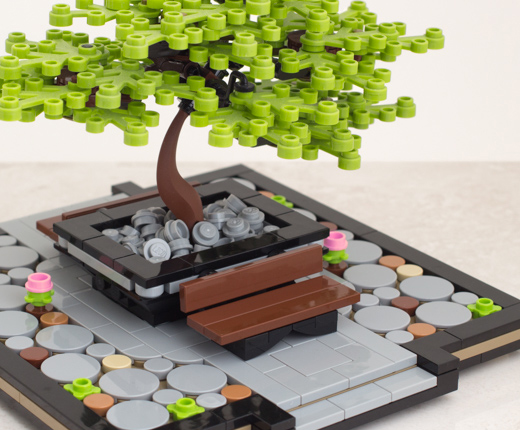 He is known for his LEGO photography, miniature models and something he has coined as “Brick Sketches.” Chris has great “cred” among the adult fans of LEGO (AFOL) community. I am one of his biggest fans and often share his creations (like the one shown below). Chris McVeigh is a LEGO builder, author, and photographer whose work has appeared in publications such as Esquire. McVeigh designs LEGO builds and sells kits to make his constructions online. You can find more of his LEGO designs on his website, chrismcveigh.com. This 7.25 x 7.25 inch book is hardbound with a matte cover. It includes 216 color high gloss pages. This book was released in September of 2016 and retails for $19.95 US and $22.95 CND. Amazon pricing is around $14 at the time of this writing. Amazon lists the book as a paperback. This is not correct, it is hardbound. The square shape ensures this is not only an attractive instruction manual, but also an excellent Christmas time coffee table book. The traditionally bound book includes imaging inside the front and back covers to highlight the models inside. The glossy pages can make it difficult to review details while building; however, that same gloss gives the book a premium feel while browsing. The book is the perfect size. It lends itself well to the tagline on the back of the book, “Merry Brickmas!” You can’t help but want to browse and review this book. 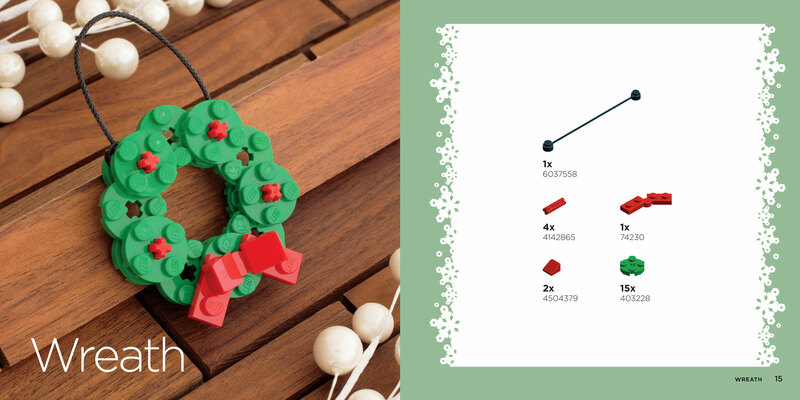 The book, while small in size, is packed with ideas to make your LEGO holiday celebration festive. The intro is short. A single contents page follows. Chris includes 15 builds ranging from heavily holiday influenced Christmas Tree and Present to more non-holiday related builds such as Computer and Burger. Model difficulty ranges from beginner, Wreath, to expert, Camera. My personal favorite is the “nod to the 80s” Arcade cabinet; in varying colors no less. The amazingly accurate Camera, shown in the image below, is a close second. Chris includes a retro Computer model that is reminiscent of a 1980s IBM PC. It is shown in the collage below. As a 1980s Commodore and Apple fan, my only wish from Santa is the inclusion of a model from those brands. The book ends without fanfare and includes a brief blurb about Chris and a link to his page. I highly recommend you review his page to get a feel for his style. The instruction pages, the majority of the book, provide all the information necessary to create each model. 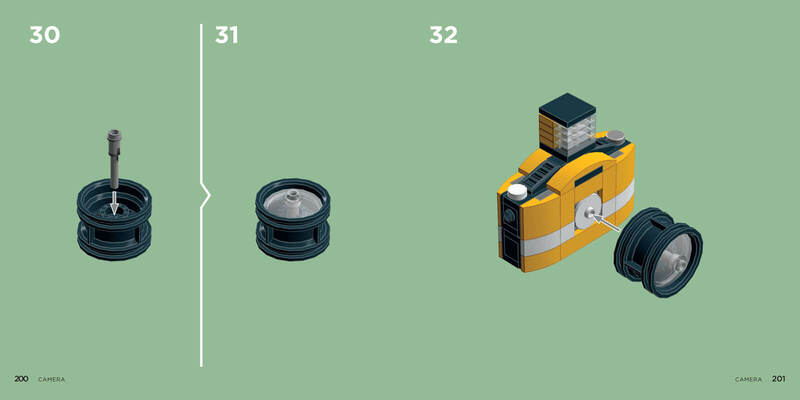 A materials list before each model, and opposite a completed model photograph, assists in the identification of the elements you will need for each build. Build steps are numbered to keep you on track. When necessary, the instructions include arrows to ensure correct placement of elements. I had no trouble following each step and enjoyed the colorful and visual style of the instructions. This is the perfect holiday book to purchase for yourself or as a gift for your favorite LEGO fan. Its smaller size makes it an excellent stocking stuffer. That is rare in the world of oversized and tome-like LEGO books. Although it does make a great gift, I recommend you grab a copy before Christmas and build your way through the pages. This is a great way to begin your Christmas celebration. The models you build will look nice hung on your Christmas tree or next to Santa’s milk and cookies. Finally, the models themselves make become wonderful gifts for the LEGO fan on your “nice list.” Even non-LEGO fans, the “naughty list,” will get a kick out of these models. Place the models in a small gift box, or use ornamental string and hang them off larger packages. These models are sure to put a holiday smile on the face of any recipient. If you don’t have the bricks necessary to build these models, Chris provides kits for many of them on his site. Get your copy today and “get to building.” Christmas is just around the corner and thanks to Chris, we can celebrate and decorate in a very LEGO way.